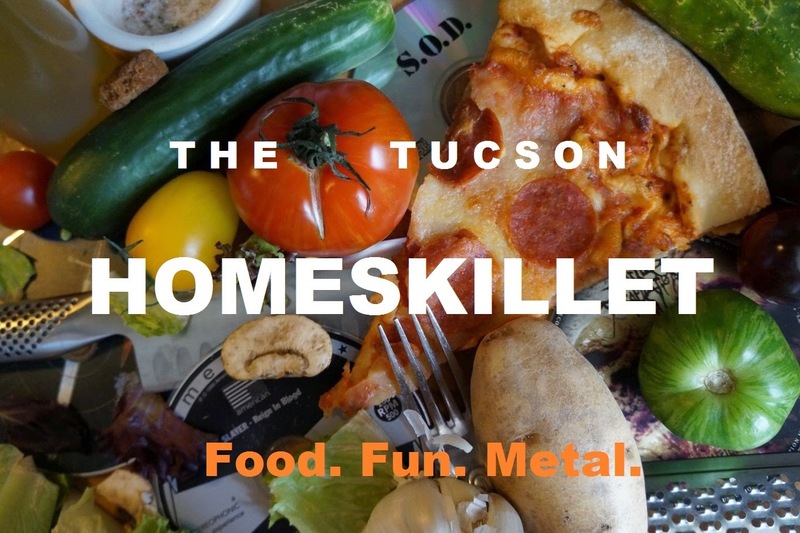 The Tucson Homeskillet: Welcome back Speakeasy! My introduction to Speakeasy beers was when I was living in San Francisco, the home base of the brewery. It was the late 90s, possibly early 2000s (things get a bit hazy through time and beer), and a good buddy of mine was doing the books for the fairly new operation. 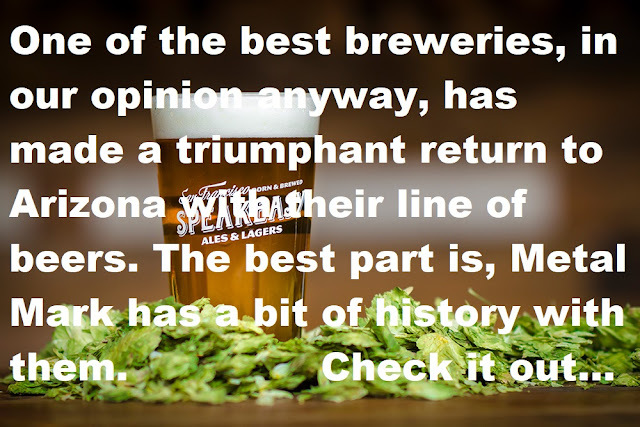 Back then, as you do in your 20s, I was consuming mostly garbage beers; Hamms, Schlitz, Rainier, Natty, PBR, etc, the trail of beer tears was endless, mostly because of financial woes combined with a palate that had yet to reach full craft beer potential. 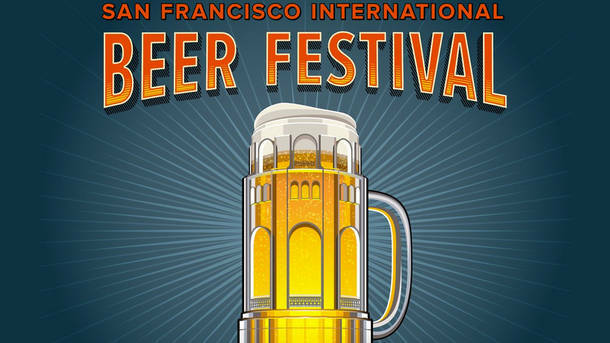 One day I get a call and my friend asked me if I wanted to work the San Francisco beer festival with him and the dudes from Speakeasy. 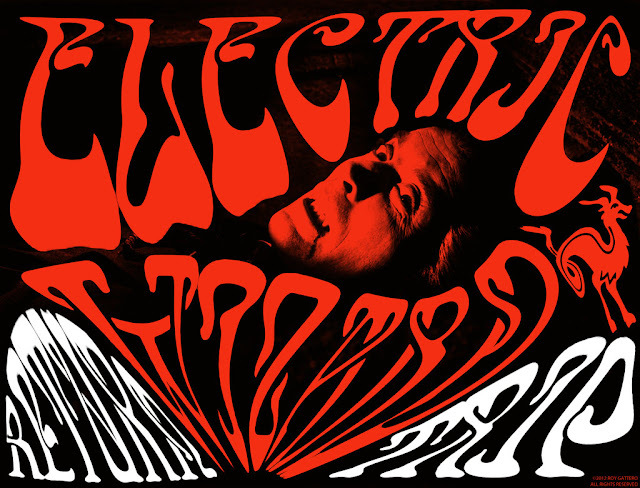 That current phase of me was being a freelance music journalist and Heavy Metal DJ and my pal said most of the guys at Speakeasy were old school punks and metalheads. Plus there'd be free beer. I agreed to help them out that day. When I arrived at the SF Beer festival, which, that year, was held in a warehouse near the wharf and right on the ocean, I signed in, got my volunteer t-shirt and found my buddy. He introduced me the Speakeasy crew and all of the guys, as kinda promised, were laid back rocker types. My duties that day were to greet people and hand out samples of their beer while the brewers did all the explaining and schmoozing. At the time they had 3 different varieties: an amber ale called Prohibition, an IPA called Big Daddy and, I think, they had a pale ale called Untouchable but I might be wrong here. The event was filled with vendors, various local and visiting breweries plus a slew of eager volunteers. After I got my briefing on the various ins and outs of Speakeasy beers, I walked around and checked out some of the other sudsy delights up for sample. The temptation to try them was all too fervent but I didn't want to be drunk before they even opened the doors. When I made my way back to the Speakeasy booth the boys wanted me to try the beers, to, you know, have some knowledgeable input for the arriving guests. I tried the Untouchable. Really good. A little spicy and malty. Then came the Prohibition. Sweet and very smooth. But it was when I downed the Big Daddy that I knew I was in trouble. I had never had an IPA before. Didn't even know what the IPA stood for. So when that hoppy, citrusy, crisp wonder splayed my tongue and gullet I knew right then and there to ditch the dirt beer and go for the real gusto. It was so good. I had no idea beer could taste like that. Had no clue that beer could affect the senses like that. By the time they opened the doors to let the throngs of ticket holders in, I was seriously buzzed. On Big Daddy IPA. I couldn't help it. My brain and stomach just couldn't get enough. Hour 2 of the beer fest and I was floating. 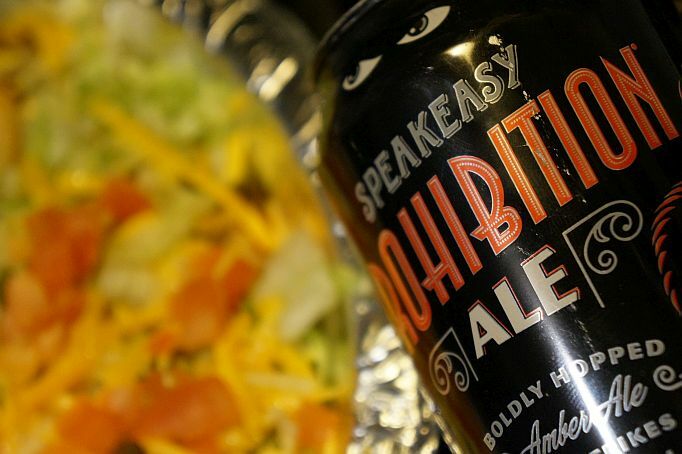 All of the other breweries had great products but Speakeasy was by far my favorite. By the time the event ended I was loaded. Luckily there was a big buffet for all of the volunteers and brewers and I ate as much sausage and pretzels I could to get me back to semi-reality. To top it all off I lucked out by hooking up with a sweet girl with curly blonde hair. It was that kind of magical affair...to say the least. 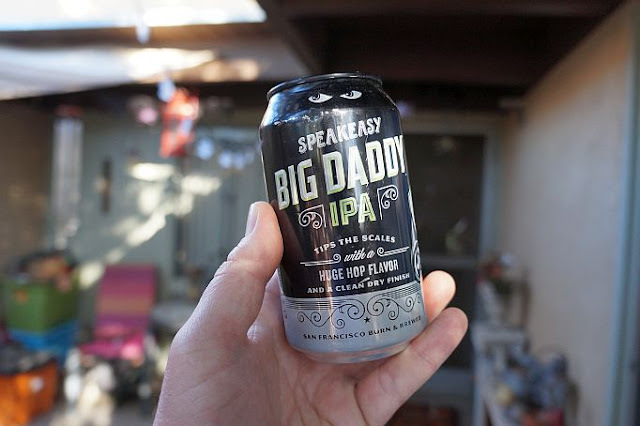 The remaining years I lived in San Francisco, my go to beer was the Big Daddy, but any Speakeasy variety would do in a pinch. My long defunct hangout, The Crowbar, always had Speakeasy on tap and when a limited edition line hit the shelves at random liquor enclaves I always snatched it up while the getting was good. I spent more than I should have on that beer knowing there wouldn't be any waiting for me back home in Tucson. Fortunately I would be proven wrong. A big box booze chain actually carried it on their shelves. Hooray! Yeah but only for a brief time. When I asked some beer rep friends about it, they informed that Speakeasy had lost funding, or got bought out, lost over state line distribution, something like that. It didn't matter. Whatever the reason, it just meant that I couldn't get Speakeasy products unless I return to San Francisco. And that wasn't going to happen. At least anytime soon. A friend that works for Hensley Beverage gave me the good news that Speakeasy was back up and running and distributing to Tucson. Woohoo! Turns out they got acquired by Hunters Point Brewery and that acquisition gave them enough of a budget to redistribute to Arizona and beyond. They hired a new head brewer and have expanded their malty and hoppy horizons by adding a porter, pilsner, saison, an American lager and two offsets of the Big Daddy IPA, a Baby Daddy session and a Double Daddy imperial. I've tried them all and, wow. Am I in trouble. Again. While the Double Daddy packed a serious whallop the Baby Daddy went down a bit too easily. It's all just so gosh darn tasty. Cheers Speakeasy but I'm gonna have to pace myself here. 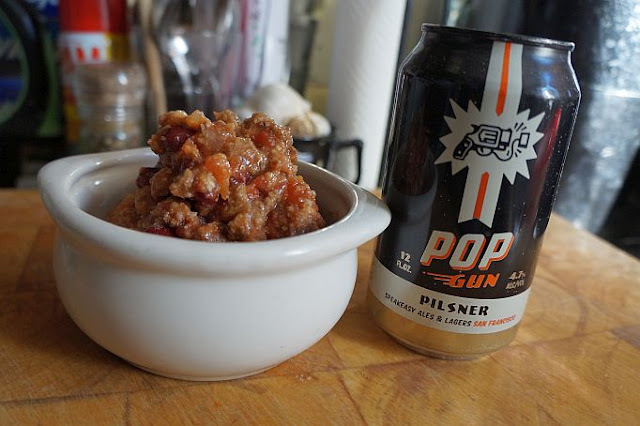 Their new pilsner, going by the name Pop Gun, is malty and sweet and I used it recently in a giant pot of chili that I made for a rainy monsoon night. I'm also really excited to try their Old Godfather line of barleywines, but that'll have to be for a special evening as most barleywines come close to about 10% APV and I'll probably need the next day off as well. Not too sure if Tucson will get this but Speakeasy has introduced a line called the Syndicate Series, which are barrel aged vintage ales and top the APV of their barleywines. Again, it's one of those "close the curtains and bust out the comfy chair" types of drinking sessions. Perhaps if I order some German food I should be okay. It just seems to help. Still, I'm an old school Speakeasy guy so my favorites of their current line of beers has to go to the Prohibition and, of course, the Big Daddy IPA, the one beer that changed my perspective on how a beer can just go beyond a cold thing to drink and get a buzz on. It's more than that. For me, its also a memory twitch. That day spent in a packed warehouse with thousands of hop heads bopping around the various tables flush with golden, red, black and sunset hued glories, some with foamy heads, some with not so much, all waiting to be quaffed, admired and thought about, then eating delicious German food before making out with a cute girl, all comes back to one beer and one brewery. We hung out at this place in evening last week before heading out to our next destination. While we were there we found the service to be quick and attentive. Probably because it was early on a Friday and the event venue was still kind of empty.